With a demolition permit in-hand which was issued in March, the command center for the deconstruction and reconstruction of 1600 Market Street as a five-story, mixed-use project without any parking (except for 14 bikes) has finally been moved into place. An even mix of one and two bedroom units, we’ll note that one of the twenty-four units will be market rate as will the 3,776 square feet of retail space on the ground floor. 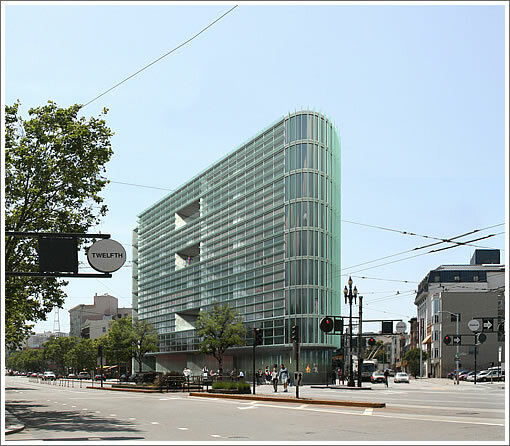 The Saitowitz design for 1600 Market Street prior to the project being changed to a Below Market Rate (BMR) building and subsequently value engineered. 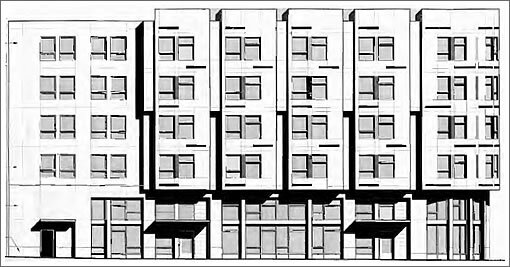 Looks like Saitowitz’s proposed design was slightly less horrid (not obviously neo-brutalist architecture like most of the rest of his oeuvre) than what we’d expect from him for a market-rate project, but we’re better of without it nonetheless. That’s not to say what Forum Design produced is wonderful, though. I liked the Saitowitz design better than most of his work, maybe because the site forced him to think outside of his usual rectilinear boxes. The Forum building looks like most of the current infill in Hayes Valley. 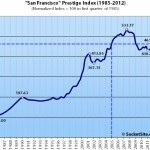 Future generations will recognize this as the look of San Francisco in the early 21st century… for better or worse. Sorry to see that the Saitowitz design was shelved. Glad to see that this site is being developed properly though. No one is more of a traditionalist than I am, but if you like architecture, the Saitowitz design is far superior, something that would, some day, appear in a book on San Francisco. The Forum design is unedifying, a “Richmond Special” of our time. The Forum solution is yet another blandtastic offering for SF. All the more disappointing given the high profile location. A crime the Saitowitz option was not chosen. Is this a case where the Forum offering is 1/3 the cost to build? More bland, boxy stucco crap. Truly a missed opportunity in a prime location. I assume the first HOA meeting, and every HOA meeting will have as a permanent agenda item to raise the HOA dues of the sucker who buys the one market rate unit, and lower the rest of them, until the value of the market rate unit equals theirs. You would honestly have to be completely insane to buy that unit. it’s a shame about the design, but i’m just glad that there’ll be no cars parking – hopefully that means a retail wrap. No car parking? You can bet roughly half the buyers will own cars. That’s could be a dozen cars competing for street parking. There are things you can’t really force into people. But I understand the purpose. 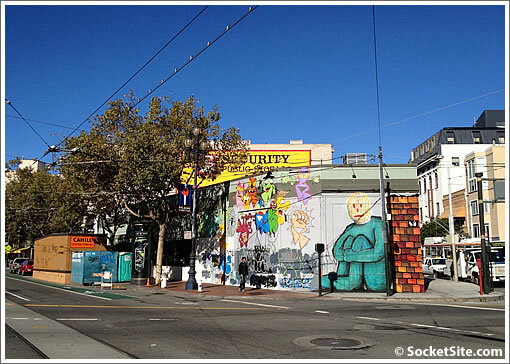 Page Street is a great cycling route from the Haight. tipster, your cynicism is well-taken, however if you believe in efficient markets (hah! ), the one market rate unit in this building will have to sell at a substantial discount to an equivalent unit in a mixed or all-market rate building. I don’t think, just based on what I’ve read, that HOAs can get away with doing what you’re describing, however. lol, assuming your assessment of ultimate buyers is correct, after a fair amount of time, the majority of those buyers will either sell their units and “move up” to units that have parking (and are priced to compensate) or they’ll sell their cars after they’ve adjusted to the car-free lifestyle. The marketplace and financial pressure are very effective at “forcing into people” rational behavior. The “marketplace” you are talking about will be seriously constrained by the fact that these are BMRs. By definition someone who goes into the BMR program has a to be a first time buyer. Therefore, if they want to move out they’ll probably have to pay more than twice the BMR price. I guess they’ll stick with street parking. In their attempt to make people “equal” the left always makes the less powerful suffer the most. In what Commissioner Moore recently called her “social experiment,” she intends to deprive the BMR people (and anyone else available) of parking spaces, even in neighborhoods like this that are already overrun with hunters of spaces on the street. She hopes they will give up and live without cars, betraying an ignorance of human nature and modern needs. conifer’s comment made me realize that I allowed myself to get sucked into the usual rhetorical trap (brilliant as it is in its deceptiveness) that people on the right like to lay when it comes to mandatory parking ratios. I want to amend what I wrote above. lol and conifer: it’s all about options and the freedom to chose them. If people don’t want to adopt a car-free lifestyle and don’t want to (or can’t afford to move), they’re not limited to parking on the street; they can always…wait for it…lease parking from a third party parking provider. It’s not a matter of left-wing social engineering, even if someone clueless like Kathrin Moore says that it is. It’s letting the marketplace work it’s magic. People on the right should appreciate that. The buyers who value parking will wind up paying for it one way or another (by moving or by leasing parking) and those who don’t, wont. Also: human nature? Please. People lived for the overwhelming majority of human history without the automobile, and even taking into account “modern needs”, one hardly “needs” an automobile to live at this location, especially given it’s for BMR units. The walkscore for these units will be 94 out of 100. As everyone who buys a BMR knows, the only way to get into the program is via fraud. It is simply not possible to afford a mortgage, insurance, taxes, and HOA in the BMR program without somehow having undeclared income. As for parking, that is a red herring as there are quite a few monthly lots in the area that are under $150/mo. A BMR is not freedom. Au contraire. You’re being railroaded into the only option that you have to own property in the City. If a tenant family has decided to put down roots in SF but cannot afford to purchase at market rate, they’ll shoot for BMR. But they’ll have to accept whatever rules and conditions have been defined for them by people who claim to know what people need. Hardly my definition of freedom. People can lease parking, true. It’s an option. But is this really what the BMR target segment would want? About a high walk score being an argument against car ownership, it’s debatable. My walk score is 100 and yet I own a car. I also do more than 80% of my city trips on a bicycle. I wish we had a decent subway system that would allow me to do the heavier grocery shopping without a car. But we still have a substandard public transportation system that relies on buses like a third world medium-sized city. Housing and parking are big ticket items that markets provide most efficiently when unbundled. People who demand both together and can pay for that are likely to be buying single family homes instead anyway. I’d argue that a parking space in your building is worth far more than one 3 blocks away. While unbundling parking may sound like a good idea, it’s pretty difficult to do efficiently in practice. Besides the fraud element I described earlier in the thread, BMR units offer all of the downsides of ownership and yet none of the upsides. BMR owners get government bureaucracy and regulation in the worst way. For example, the maximum amount a BMR owner can sell for is dictated by a formula set by the BMR program, not the market, yet if an owner has to sell at a loss, the maximum that they can lose has no cap and is at the mercy of the current market. The ability to buy a BMR limits the BMR owner to only be able to upgrade and purchase other BMR units as their family grows assuming that the total family income stays under the restrictive income guidelines set by the city. The only upside to the program I can see is if a starter family movies in and has a member with a career track that leads to income growth, then that income can be saved to purchase a larger property, likely outside of the city, since the difference between BMR prices and market prices is so vast. To circle this argument back to the article at hand, this project is in an excellent area, makes for a good selection for individuals and families that want to live and work in San Francisco. I’m skeptical that individuals and families that are coming in at BMR-levels are actually living/working in SF, and will probably need a car to get to their gig in the South Bay. In spite of many Socketsiters contention that it is not possible to survive in a modern society without an automobile, somehow 30% of San Francisco households manage to do it. This development is presumably targeted at them. Of course it is possible to survive in SF without an automobile. It really depends on your own personality though, especially your level of patience. I spend 1/4 of my time in Paris and never ever have to use a car. Whatever benefit you could get from using a car would be nixed by the waste of time moving around and looking for a place to park. But in SF a car can save you some time in many scenarios. Cycling works pretty well for me for commutes, going out, many errands. But a car gives me the extra freedom that the city denies you by being so sloooow to develop decent public transportation. For instance, picking up my other half in the Tendernob from her job: after 7PM there’s no way I’ll let her walk among the crazies and the zombies of the TL. ^It sounds like you’re not in the target demographic for a building without parking then. I’d suggest not looking at one of those buildings, but instead one of the others that has parking. Simple as that. ^ I nominate anon for best comment. ^ No I am not the target because I am far from the requirements for BMRs. I already own. Market rate, thank you very much. But a family making 90K with a job in the city will be very lucky to have a perfect job situation 100% of the time. Say your wife loses her job and needs to work in the boonies, Marin or some hard-to-reach area of the South Bay. Or you say you decide to have kids and you have to move them across town because of the f-ed up public school enrollment system. No private school at this paygrade neither. Look it up. It’s at the top of the list of the reasons people keep a car within SF! Or maybe they’re targeting families making 90K who do not want kids and will always work along Muni. I rest my case. Life happens. A number will not want cars. Others will. Others will have no choice. That’s the way it works. Not adding cars means externalizing some of the cost to the neighbors. I am certain they will not all be happy. To the comments about how easily people got around before the invention of the automobile, just watch the pre 1906 film with all of the traffic shown on Market Street. Many of the vehicles were horse drawn carriages, and horses have been used for transportation for centuries before cars. There was a time when apartment buildings in New York came with, or had stables nearby. Removing any parking in the city will not achieve the Luddite goal of turning back the clock on science. People will always select a faster easier form of transportatioin, and will move their jobs to areas where they can live easier lives, which is why the SouthBay has surpassed San Francisco long ago as the population and job center of the Bay Area. To go back to anon’s out-of-context comment. Saying: “why don’t you shut up, this building is not for you anyway” is beyond the point. We’ll all have to live with whatever social experiment the city is trying. I provide examples and context instead of nice theories and dogma that are disproved day after day by reality. If the city wants less cars, it should start to massively build the appropriate transportation system. But “dreaming” that people will not bring their cars when they’ll move to this building is like the ideologues trying to grow wheat in Siberia in the 50s “knowing” wheat would adapt to cold. Dogma vs reality. Some people will never learn. Dream of the 1890s. Enjoy. Street parking is not a right. If the neighbors banded together and came up with a market-rate auction for street parking permits, and then handed the money raised from that equally to all members of the neighborhood, then things would be a bit more fair. I don’t care for carpet, but I certainly understand that some people want it. I’m not clamoring for the city to ban the installation of carpet so that I have my pick of any housing being built. The city isn’t requiring no parking here, so I don’t understand why you think that it’s the city “wanting less cars”. I’m flabbergasted by folks who think that if the city doesn’t *require* parking it must be some kind of socialist conspiracy to get us to all get rid of our cars. Flabbergasted. I quite like my car, which is the reason that I bought a parking spot when I bought my unit. Not sure why I should force others to behave exactly like me though. Not sure why you feel that way, but whatever, I’m more of a hands off kind of guy I guess. At least, we should provide the option. With this project, the developer are providing BMRs but decide to do it more economically and I perfectly understand that. But this means the neighbors are supporting much of the burden of the savings from the developer. And yes, the City could impose a car/unit ratio. It happens all the time. If the City decides not to impose it means they are willfully accepting the situation. Spreading a few no-parking-spaces BMRs in a bigger project can dilute the pain. But putting them all in one place is a harder sell. In general, I am for removing as many cars from this City as possible. Heck, I am a cyclist first. If we add 100K extra people, we will probably have 50K to 70K extra cars, whatever they social background. A chunk of the new residents will be looking for street parking and create extra traffic. We should be digging up new subway lines everywhere in this City. The current pace is beyond ridiculous. Exceeding SF’s job and home count has more to do with the fact that the south bay has 5X more buildable land than SF. People will always select a faster easier form of transportatioin, and will move their jobs to areas where they can live easier lives, which is why the SouthBay has surpassed San Francisco long ago as the population and job center of the Bay Area. The City is increasingly competitive with the South Bay because the South Bay is full of huge tracts of single family homes on large lots that are limited to 24-30 feet in height often with complicated rules for how second stories must be set back from the ground floor. The result is that the City can and does continue to build up while the South Bay is stuck with existing housing stock and has no methodology for incrementally increasing density to make room for new residents. Today it is a pile of rubble. 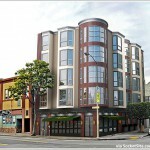 UPDATE: 22 New San Francisco Condos For Under $224K, With A Catch.